John Lewis are running a deal with quite a few selected Eastpak luggage pieces reduced to clear. 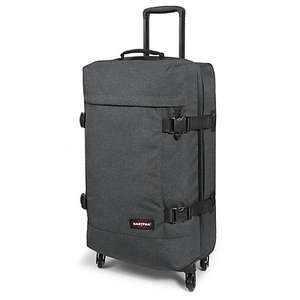 One of the best seems to the the Trans 4 wheel suitcase which holds nearly 70 litres. There is also a two wheel version for £65. Edit 2: No? No comments. Weird. It's almost like you are voting based on what price you think luggage should be rather than the 50% saving. Amazon prices are hovering around the £123 mark (lowest it has ever been is £88) so this is a saving of over £50 from the current prices. The Eastpak Trans4 4-wheeled suitcase has a double-deck design to provide you with ample packing space. It is fitted with side compression straps to give you the option of increasing or decreasing the volume of the case to suit your needs. Both internal compartments are zipped, meaning any luggage stored in them will stay in place. Its four-wheeled design has complete 360° movement, allowing for ease of transport around busy airport floors. This trusty soft-sided cabin suitcase can be easily lifted from the luggage carousel — aided by its telescopic handle and padded handles to the top and side. An additional zipped pocket is provided to the front for securing smaller items. I had a eastpak rucksack lasted 10yrs however the only thing wrong was it was very dirty and one of the straps had broken..but these will last. Good find. I've got an XL and an XS (cabin sized) and they're both going great. I went for the one linked to above. It looks like Amazon were offering it for £70 for a couple of days leading up to Black Friday, but nowhere else has prices near that now.  We fly out on holiday Thursday and our old Antler luggage wasn’t looking up to it so popped to local JL and snapped up a bargain. Albeit I spent £340 but would have been £680. Definitely get one if you can find a good deal.